In short, everything you need to make consistent sales in your business every month. Not once-in-a-blue-moon. Can't figure out this whole "tell people what I do and then they buy it" thing? I feel you. If you are a creative, the idea of asking for the sale makes you want to vomit. Not only does it feel like a totally drag to tell people about the work you do but it's also overwhelming. How much do I Post? You get overwhelmed and decide to watch Netflix and pray that when you wake up in the morning you have a Paypal notification or a new subscriber. Wanna know THE TRUTH? 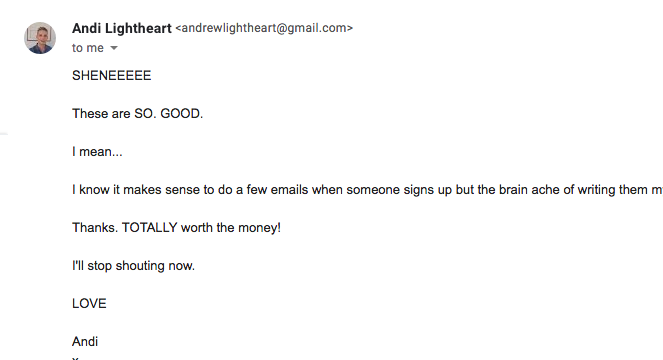 Telling people what you do and inspiring them to sign up for it ISN'T that complicated. As long as you EXPLAIN it well, you'll profit. As long as you market your stuff consistently, people will buy it. Most people WON’T do that. Most people will go through every month trying to figure out what the heck they are going to say and worrying about how the hell they will actually get clients that month. Most people spend most of their time stressed and confused about how to actually MAKE sales. Most people will watch countless webinars and listen to podcasts about people MAKING money but never figure out how to make the connection for themselves. Most people will devote way too much time drowning in random software and trying to set up complicated funnels so that they can make money SOMEDAY and never get around to it right now. Most smart and capable business owners will feel totally frustrated because they KNOW they have something really special to share but can’t figure out why it’s so hard to make a living actually doing it. Money Words Monthly is the only product of it’s kind that helps entrepreneurs who struggle to communicate what they do create sales emails, social media posts, AND blog posts designed to bring in clients every single month. SIGN UP FOR the money words monthly waitlist! Do You Need Money Words Monthly? Take this quick quiz to find out! All of the content you need to promote your offers without having to become a professional marketer or invest thousands of dollars in a copywriter to do it. That's where I come in. Money Words Monthly is a marketing and content plan delivered to your inbox. Inside you'll find everything you need to explain what you do and profit. I'm taking the guesswork out of talking about what you do. I write it and you send it. Isn't that fun? Each month you'll get a prompt and step-by-step instructions for creating a blog post or a piece of content that will encourage people to get off the fence and buy one of your offerings. You don't have to worry about figuring out what to write, I'll figure it out for you. Marketing can't work if your copy isn't working. You'll get a mini-guide for writing (re-writing) all the copy you'll need for your business so you can properly explain the work that you do and make sure people "get" it and want to sign up. What the heck do you write to your list each week? That's a question everyone asks. After writing 100's of emails over the last few years, I have a few go-to emails that I use every time, just with different topics and approaches. You'll get a new email idea every month -- one that will work for all businesses that provide services. You'll receive 5 social media posts you can send right now to your audience. Each post has endless variations so you have plenty for the whole month or at least once or twice a week. How Much Would This Cost With a Copywriter? It's a necessary evil as a business owner and everyone acts like you just know how to do it, right? I get it and over the years I've developed a library of the very best scripts and shortcuts that will have you churning out GREAT content, even if you don't consider yourself a "writer." Before you know it you'll be writing your copy, emails and social media posts without thinking twice about it. You might never become a "writer" but you WILL learn how to explain what you do and write for your business. Outsource all of that thinking you do about what to write and when and focus on doing your awesome work. It's like having your own marketing assistant for less than half the price. I'll tell you what to write and when to write it...all for less than the price of a Chipotle meal with a drink and chips. Each month you'll get an email from me with your monthly marketing goodies. Inside you'll find a step-by-step guide and scripts and guides to give you clarity. You'll also get examples for different industries. Can I get them all at once? Nope! But if you got them all you wouldn't use them anyway! One of the big problems with current marketing strategies is the OVERWHELM factor. You can't get the results from what you don't implement and this offering helps you focus on what will get your results and none of the extra stuff. I'm an original and my stuff is so unique! Are you sure this will work? Absolutely!!!!! I know that you are unique which is why I give you the scripts but also give you lots of freedom to make them your own and write in your own point-of-view. Will this work for any business? YEP! These scripts will work for products AND services. If that script doesn't apply to a product or a service, an alternative script will be offered so EVERYONE can do the homework. Each marketing guide comes with suggested uses for different types of businesses and industries. Do I get any community stuff? Yep! But you won't want to!